When everyone, or rather, almost everyone has balik’ed kampung for the Hari Raya break, that’s the best time to drive in the city. Unable to resist taking our own sweet time driving along the traffic-free roads right in the city centre, that’s how we decided to spend a leisurely breakfast in Shanghai. 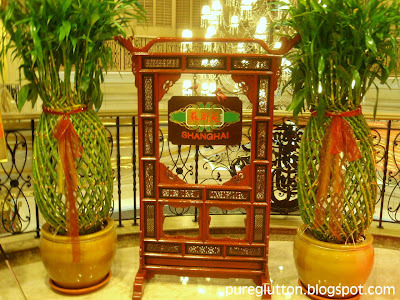 Shanghai – that’s the name of the Chinese restaurant in JW Marriott in Bukit Bintang. 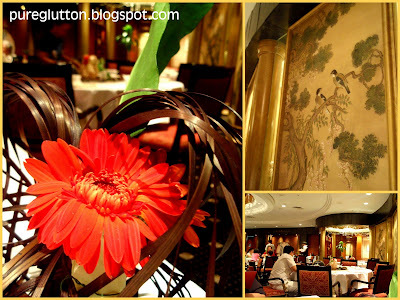 A very pleasant classy place – the rich wood panellings and brocade wallpaper, chinese paintings interspersed with gold columns give the restaurant a very warm oriental feel. Greeted by smiling waitresses clad in very professional-looking black suits (cheongsams with high slits would have been a better choice, no? ), we were quickly seated at a big square table. There were smaller square tables but we insisted on the big one, knowing very well that we’d be ordering a lot of food, hehe! 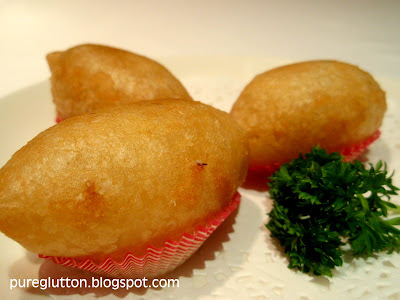 Cheng Kong Ham (RM12) was a must-order as this ham is such a Shanghainese snack. The pieces of ham blocks were beautifully marbled with meat of varying degrees of fatness, as you can see… Eat them with the ginger strips – that will help to alleviate any strong smell of porkiness if you are not a porcine fan. But for me – a definite porky fan – the ginger strips merely enhanced the smokey flavours of the well-preserved ham! The plate of Pig’s Ears (RM10) was really too pretty to eat! I know that sounds like such a weird description for pig’s ears -I mean, how can pig’s ears be pretty huh? But look at the plate of art below and you’ll see what I mean! The thin slices of gelatinised pig’s ears were deliciously-marinated with hints of 5-spices and the soft cartilage provided a nice bite. Eat this dipped in vinegar – that was what the smiling waitress told us. Good advice – it was yummy! 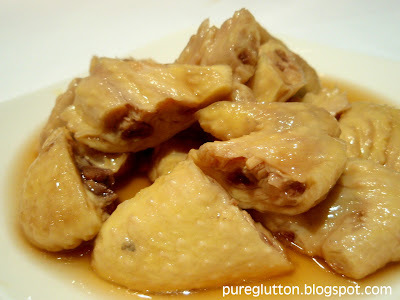 My favourite Shanghainese cold dish is the Wine Chicken (RM10) … I never failed to order this in my trip to Shanghai. Over here in JW Marriott, they use fat succulent chicken wings… which was a good choice… the wings had been perfectly infused with the chinese wine which rendered the chunks of skin+meat so full of chickeny goodness that we sucked on the bones trying to drain out every bit of the yummy juices! 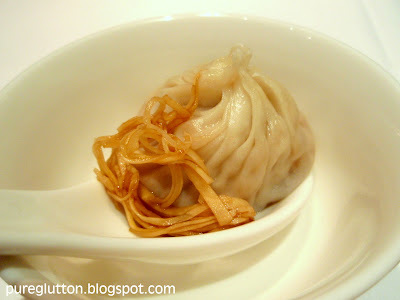 Ahh… when in a Shanghainese restaurant, we really cannot not order the Xiao Loong Pau, right or not? We ordered 6 pieces (@ RM3 each) and the tray came, with the steaming hot XLP. Ohh… they were sooo good! The test for good XLP is thin skin and LOTS of soup and those we had passed this test with flying colours! There was really a LOT of yummy soup encased in these little bundles, I tell you! The smiling waitress recommended their Ham Sui Kok (RM9) – fried glutinuous dumplings, which she told us their chef was making fresh that morning. 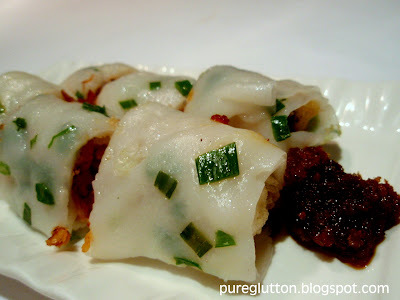 Without hesitation, I nodded my head as HSK is one of my favourite dim sum. It was an order which I had no regrets, whatsoever! Just look at those fluffy puffy treasures! The test for a perfect HSK is in the dumpling skin, which is made from glutinuous flour: it should not stick to the teeth. Most restaurants fail in this and more often than not, I end up having pieces of dough stuck in the teeth. But here… OMG… the skin was so light, yet retaining the glutinuous chewy texture – and the fillings of chopped meat were scrumptious. Next we had the Duck Chee Cheong Fun (RM12). We thought it would be like the usual meat-filled rolls and that instead of cha-siew, it would be duck meat. Yes, they had duck meat but these were chopped together with pieces of yam and encased in a layer of crispy net-like “crust” before being enveloped by the silky smooth rice rolls. One word to describe this: yummylicious! LL declared that this was the best item for the day! We were also recommended to try their “Bridge Biscuit” (RM15). 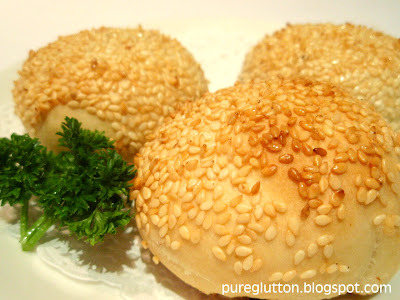 When the 3 pieces of round bun-like sesame seeds-topped pastries were served, I couldn’t see which part of it resembled a bridge?! Anyhow, despite the very misleading name, these turned out to be really good. 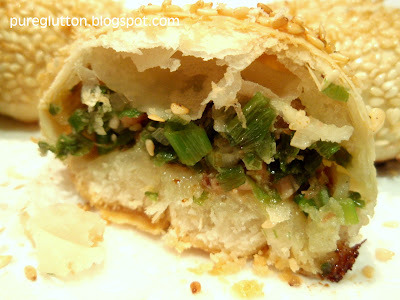 Fresh from the wok, the golden pastries practically melted in our mouths as we chewed on the tasty filling of chopped radish, chinese celery and minced pork. LL insisted on trying one of their Fried Rice because to him, any self-respecting chinese restaurant must be able to produce a good version of this favourite. Needless to say, Shanghai’s Vegetables Fried Rice (RM30) passed with flying colours. 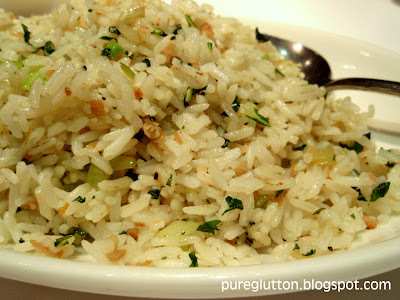 Fluffy fragrant rice tossed with a great deal of “wok hei” in diced bits of preserved veg and chinese ham. Very simple, very plain-looking… but tasted great! 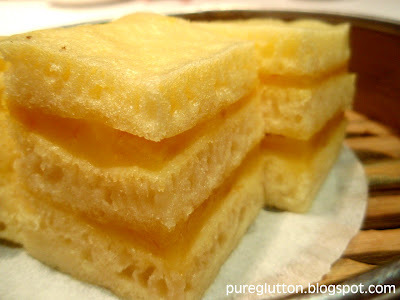 For dessert, I ordered their Steamed Layer Cake (RM12)… fluffy eggy fragrant layers sandwiched with a rich paste of salted eggyolks custard. Sweet and saltish flavours married perfectly – I really loved those cakes! The portions were pretty dainty and the prices reflect their quality, I would say. 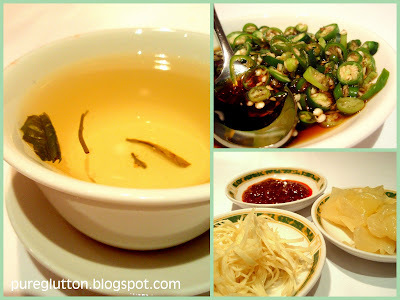 Definitely would return to try their other dishes… when is the next Balik Kampung exodus huh?? i love this place too..havent been back in ages though..
walloped ppl's shop for breakfast. seriously, the 1st few Shanghai specialties caught my attention. 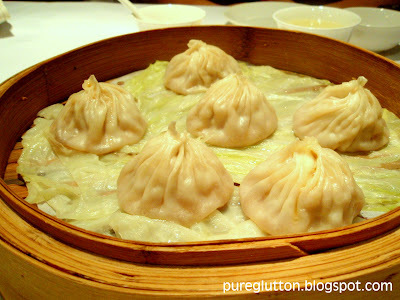 the other dim sum & even XLB not so. 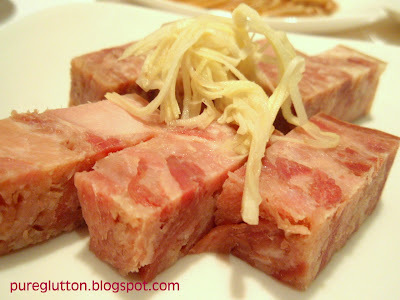 i would definetely love to try the ham, the Shanghainese snack…. hehe, for a moment, i thought u went to shanghai again. ooo..very nice selection of food you had there. i miss duck tongue and this one looks yums! 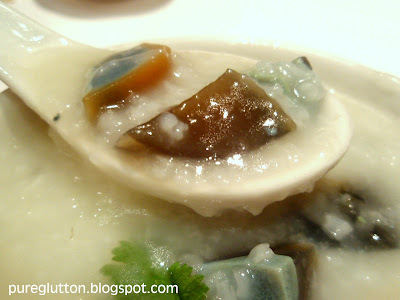 Fish and century egg porridge looks awesome!! Which reminds me, I haven't gotten my century egg fix for far too long! I need some NOW!! Great appetisers! Reminds me of Red Chili. Joe: Maybe time to go visit them again, hehe! Derek: Next time u back, we go again OK! J2Kfm: Aiyor, dont la say i wallopped people's shop, lol! Believe me, the servings are really really dainty! 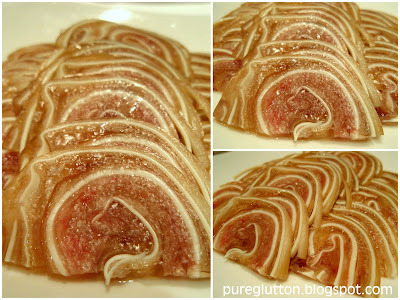 Simple Girl: Ya, the shanghainese cold ham was good! Tummythoz: Not so bad la…LOL! The portions were really small and they timed the servings well so that each item came right after we finish the earlier one! They were not served ALL at once, hehe! 550ml: Go hit the eggs now, LOL! Worldwindows: Red Chilli? Where is that? 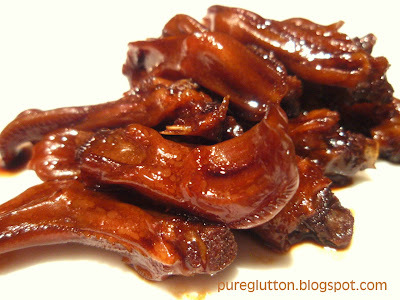 Pig ears are pretty.. pretty and TASTY! TNG: Yeah, it certainly was more comfortable! Ciki: Don't we all love 'em ears, lol! I am definitely looking forward to eating in this restaurant…all those are my favorite food.